Weisshorn condos for sale sit in an ideal location at the corner of French Street and Wellington Road, just a short block and a half from the gondola and from Main Street and the center of Breckenridge. The historic district is adjacent to this short string of ski-age, window-filled condos and historically compatible new homes were constructed where there was nothing historic. The condos are connected like row houses but designed like alpine homes that might exist near the original Weisshorn. And the condos are east of the Weisshorn neighborhood, so the reference – South Weisshorn Condos - might have been to i’s more sunny and southern location compared to the original ‘White Mountain’ in Switzerland, rather than to its eastern neighbor. Find out more about this popular Breckenridge building, or check out the active Weisshorn condominium listings found below! When the Weisshorn Condominiums were built in 1965, they were on the edge of the new and developing high-end Weisshorn neighborhood and outside the existing and historic buildings of residential Breckenridge. Vacant land lay to the north and the new ski resort was starting to fill the view to the west. The highest building in that view would have been the Chinese Laundry – a false front shop – on Main Street. In the late 1990’s when development was filling in around them, and the homeowners association was feeling pressure to develop the land it owned to the north, they worked with the town to plan small, historically compatible homes that wouldn’t dwarf or add traffic and congestion to the existing condos. Other developers followed suit, and the neighborhood has a harmonious mix of single-family, clustered homes, and condos. 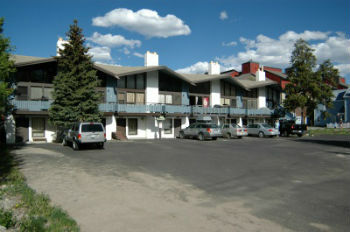 Any South Weisshorn Condo for sale will be walking distance to shops and restaurants in the core of Breckenridge. The free bus stops right out front, and the Breckenridge Ski Resort gondola and City Market are only a couple of blocks away. Open space parcels and trail access have been carefully planned so that Weisshorn Condo residents can hike or bike from home to national forest. Amenities: Wellington Condos, or South Wellington Condo as they are know in county records, are located on the north side of the historic district, just a few short blocks from Main Street, they are a small complex, and have a funky, early ski-town architecture. From the traffic circle at the north side of town take the Main Street exit, and continue along Main one block to French Street. Turn left on French and curve uphill. Where French meets Wellington Road, the South Wellington Condos will be on the right. An expert from the Breckenridge Associates team is waiting to talk to you about purchasing a condo for sale in the Summit County area. Get in touch with us now.